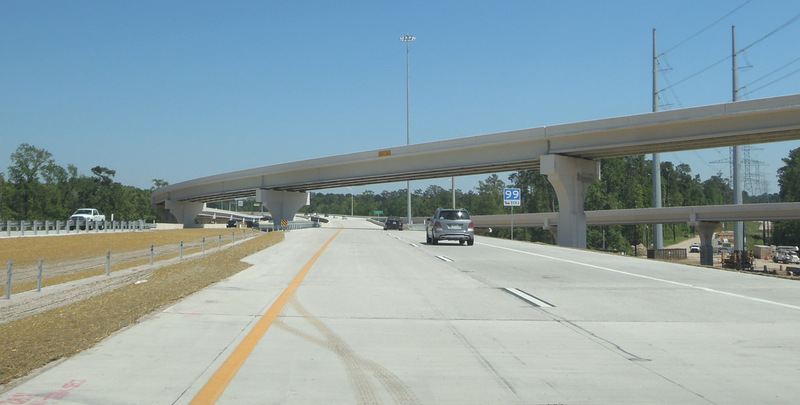 Grand Parkway section F, 24 miles between US 290 and I-45 North, opened late in the day on February 5, 2016. It was scheduled to open early in the morning on Saturday, February 6, but according to a press report it opened Friday evening. 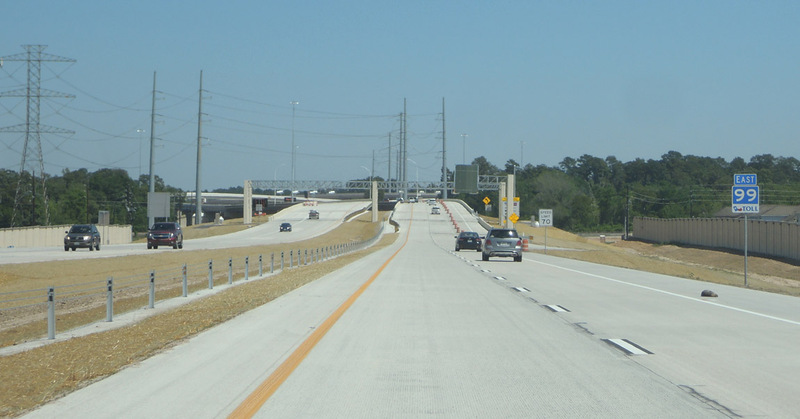 I'm expecting the east half of the section, section F-2 from SH 249 to I-45, to be very successful in terms of attracting traffic. 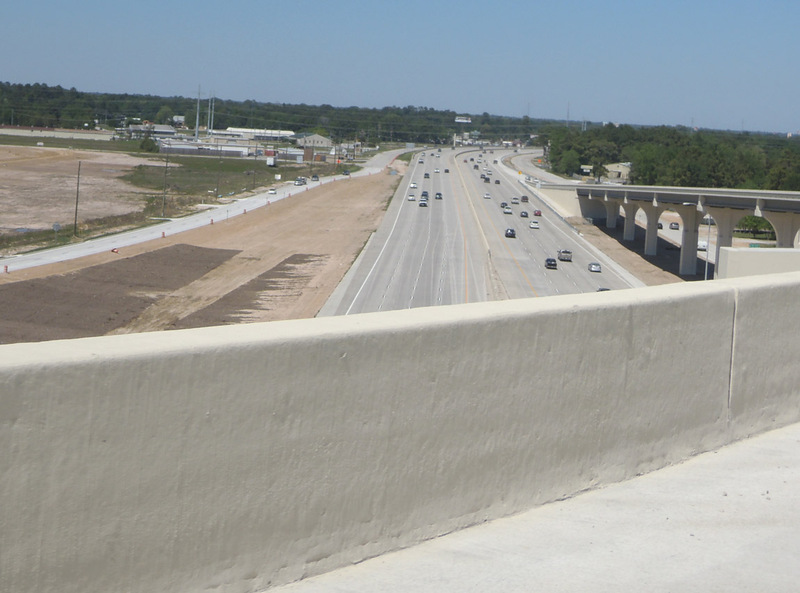 Section G, from I-45 to I-69, opened on March 29, 2015. 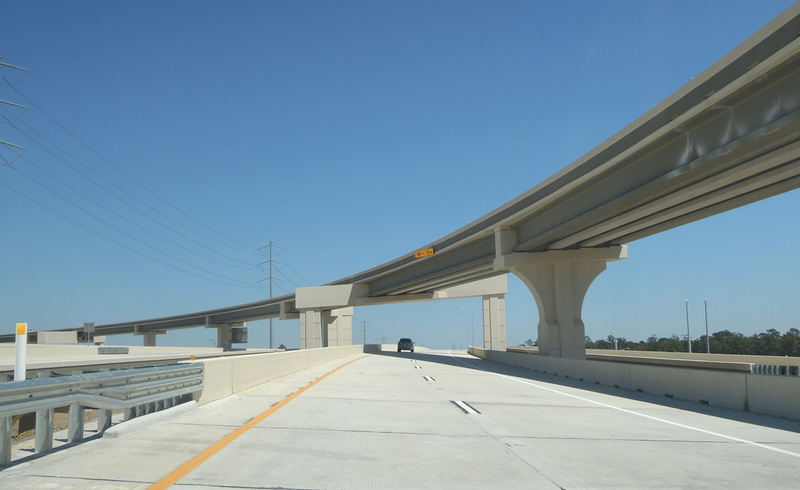 The tollway has four lanes, two in each direction, for the entire length. 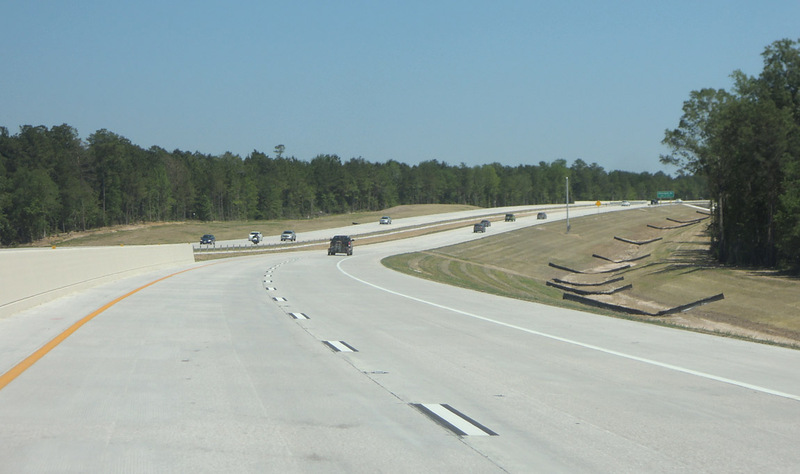 Only a few short sections have frontage roads. 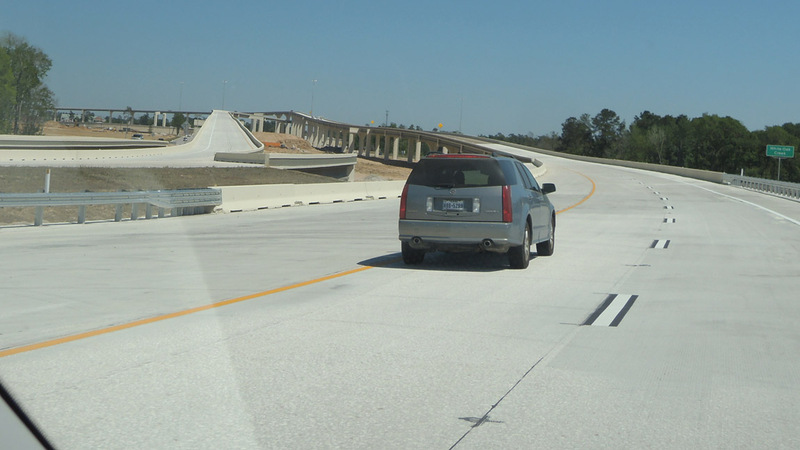 Pavement has longitudinal grooves (parallel to tires), in contrast to the long-standing practice in Houston of using "transverse tining," which is perpendicular to tires. 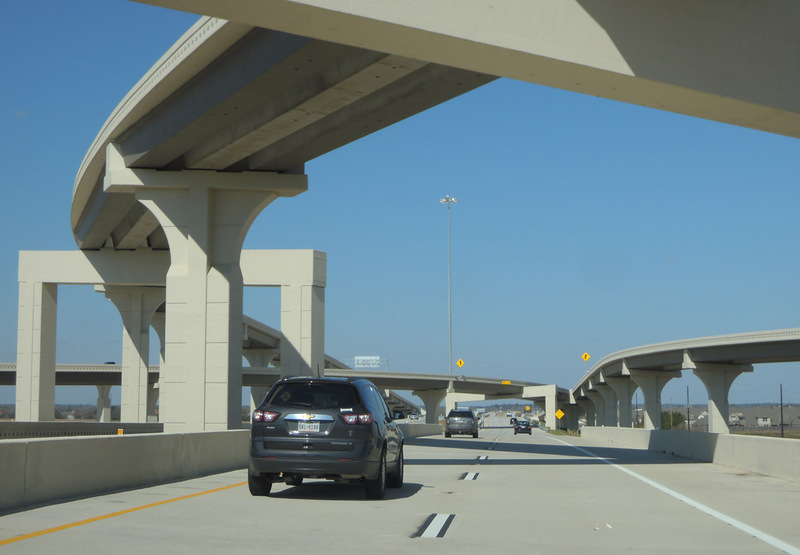 The tollway is designed to be easily expanded to six lanes by paving the median. 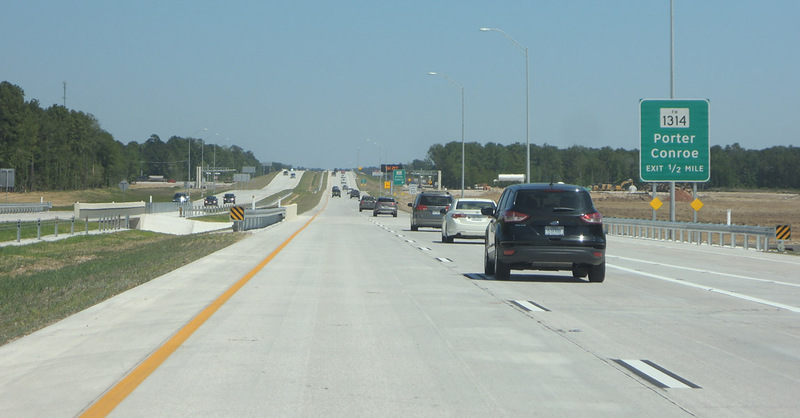 However, widening beyond six lanes will be difficult and costly. 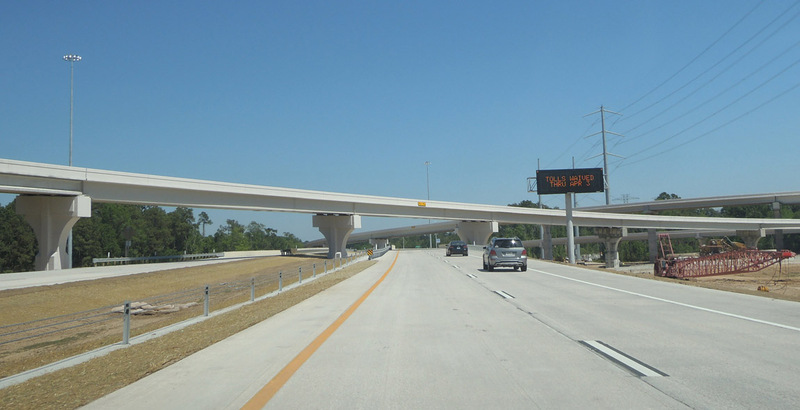 All direct connections are built at US 290. 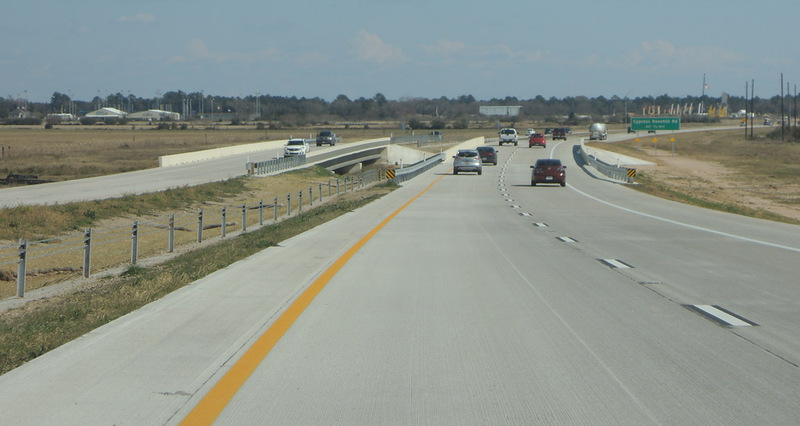 There are no connectors at SH 249, and connetions must be made via the frontage road. 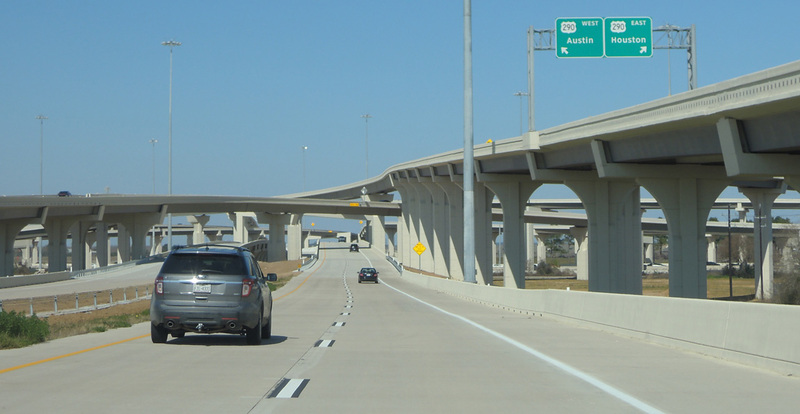 There are two connector ramps at I-45, and all other connections must be made via the frontage roads. 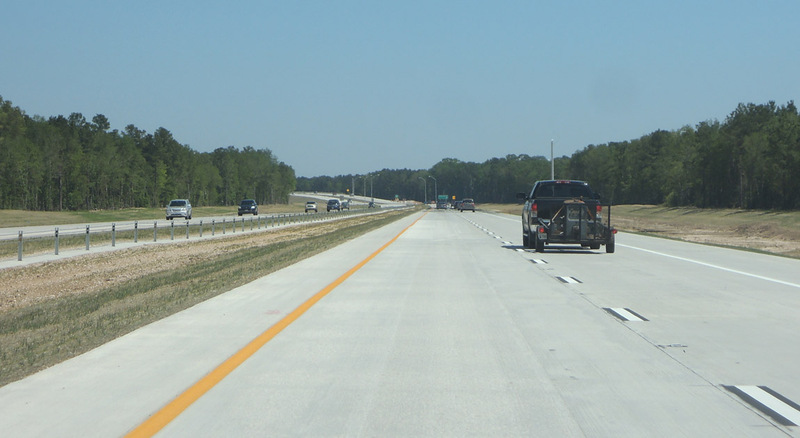 The median has a wire rope barrier. 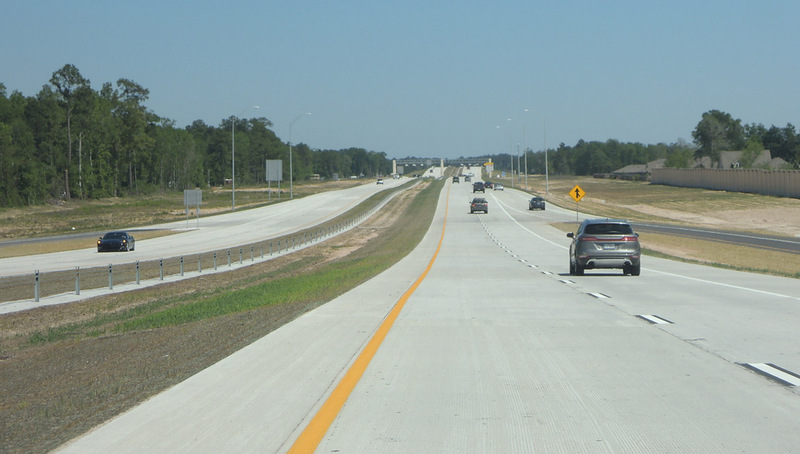 As is usually the case with toll roads, everything is basic to keep costs down. 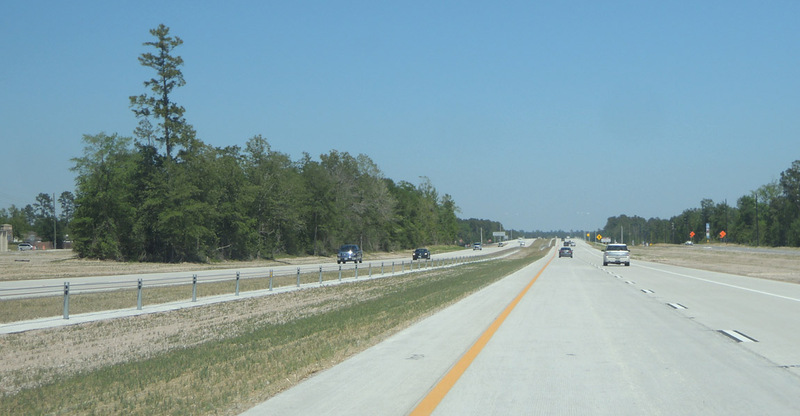 There is nothing to reinforce the idea of a "parkway" - no landscaping and no wide medians with natural foliage. 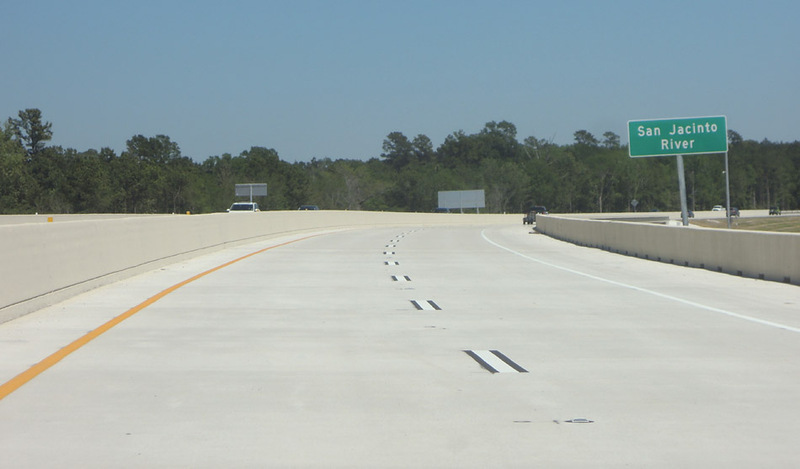 These photos start at US 290 and proceed clockwise (northbound then eastbound) to I-45. 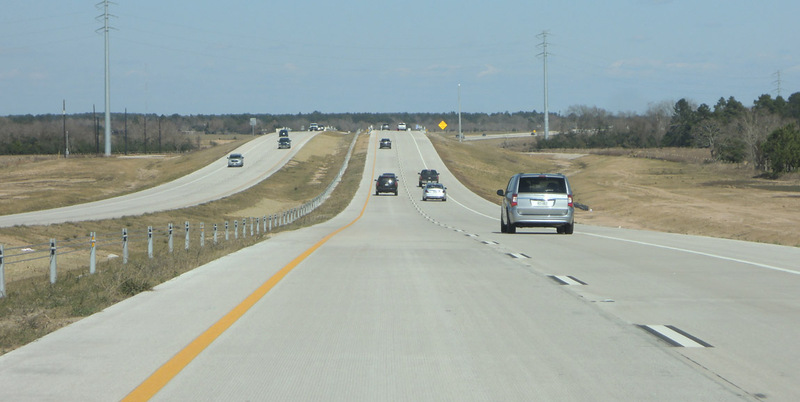 (February 6, 2016) Northbound approaching US 290. Prior to the opening, all traffic exited here. 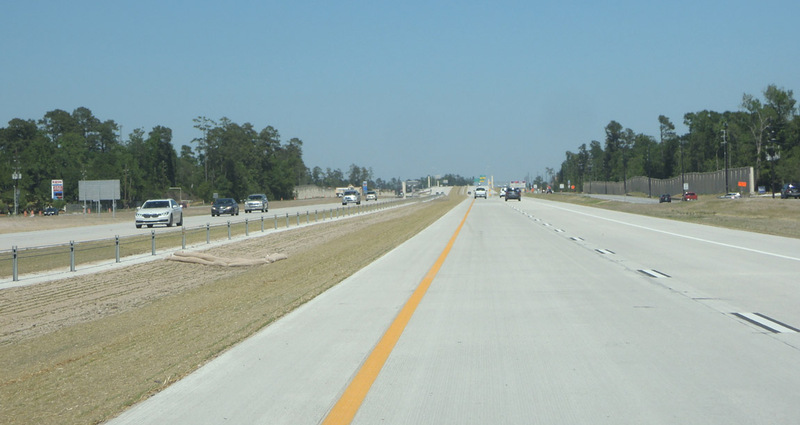 Evidence of the pre-opening striping is visible. 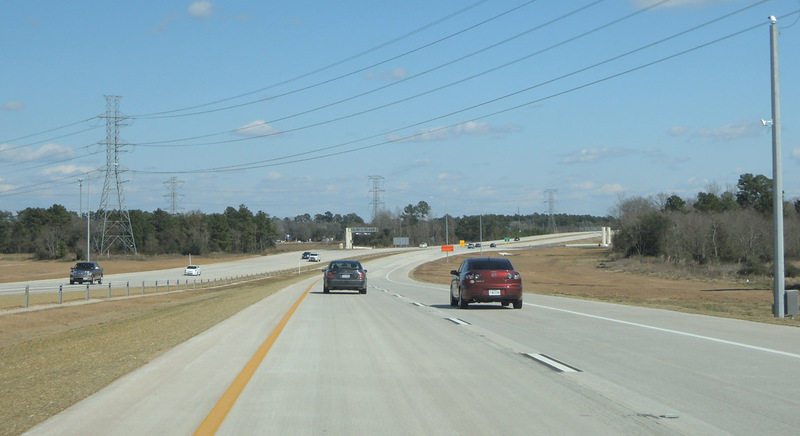 (February 6, 2016) Proceeding northbound, north of US 290. 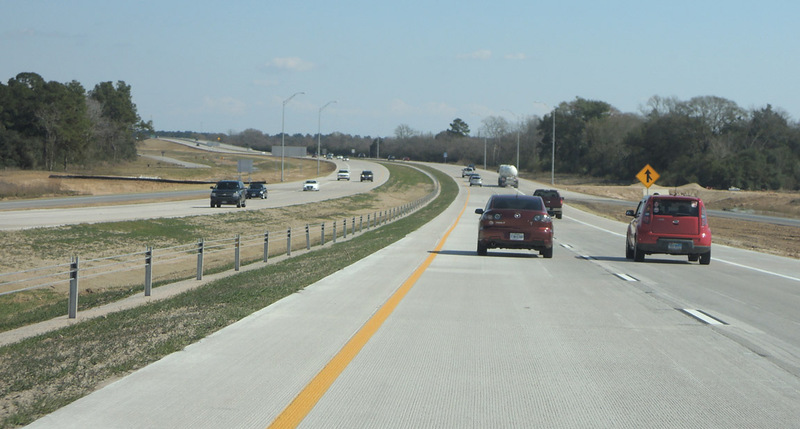 The design pattern shown here is used for nearly all of the corridor. 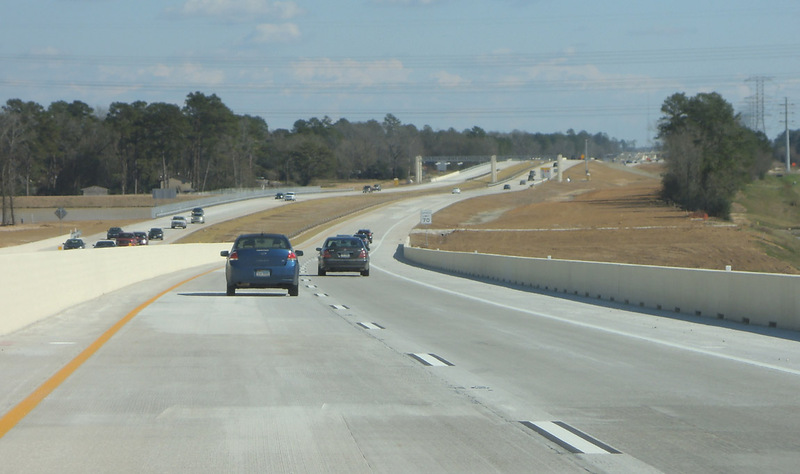 (February 6, 2016) First toll plaza. 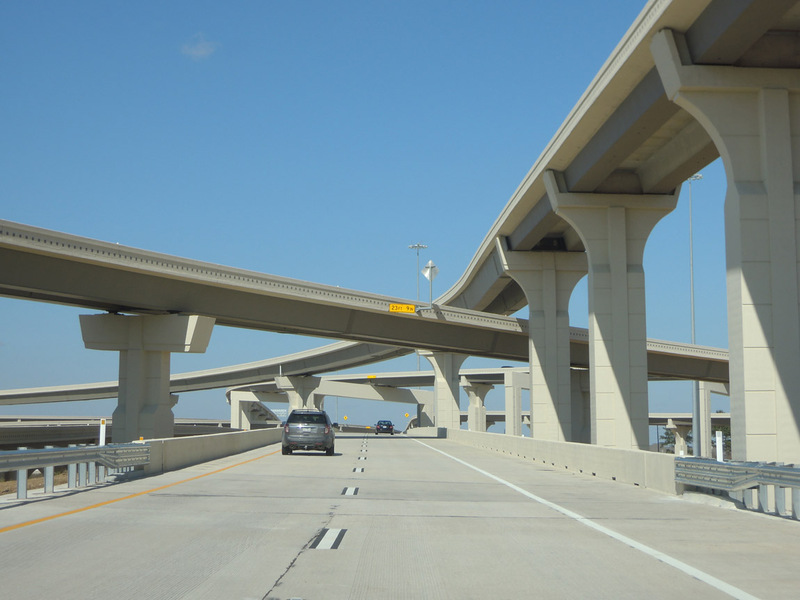 There are four toll plazas between US 290 and I-45. (February 6, 2016) The exit just ahead is Mueschke Road. 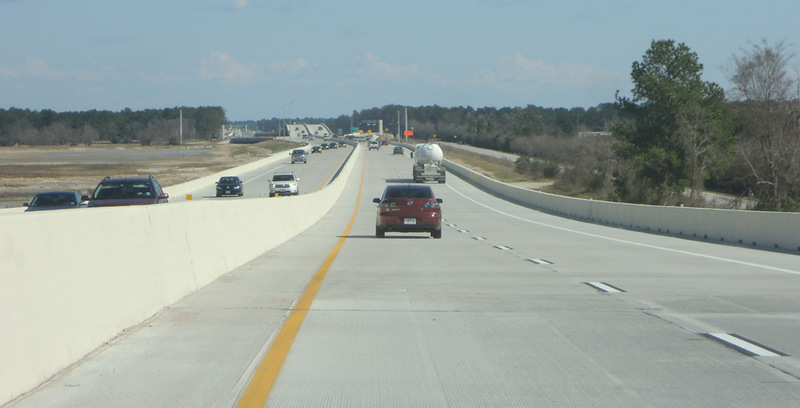 (February 6, 2016) Approaching Telge there is a long section on embankment and bridge, and there is no center median. 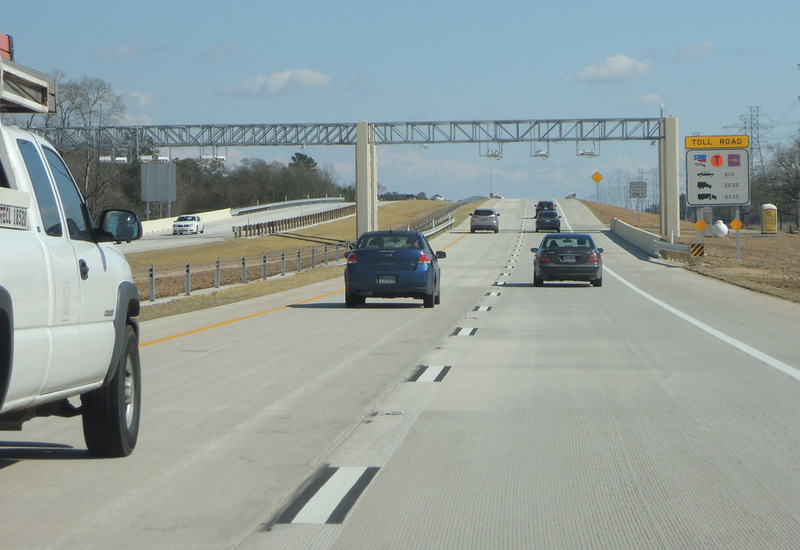 (February 6, 2016) Exit for SH 249, which is a toll road at this location but becomes a freeway just to the south. 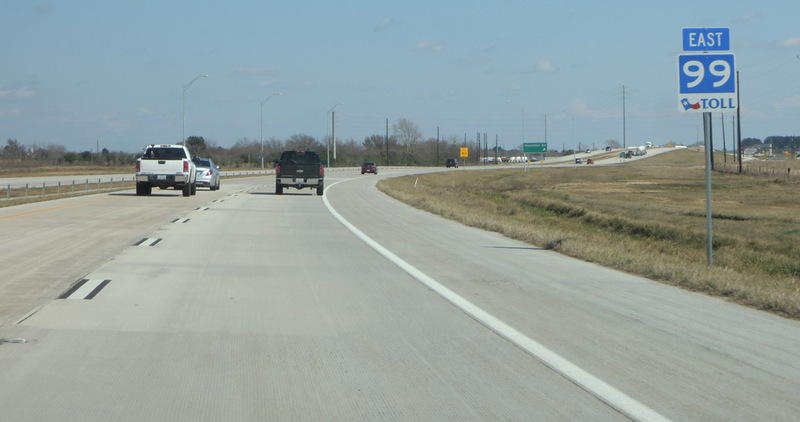 (February 6, 2016) Proceeding eastbound, east of SH 249. This is section F-2. (February 6, 2016) The median is removed at this crossing. 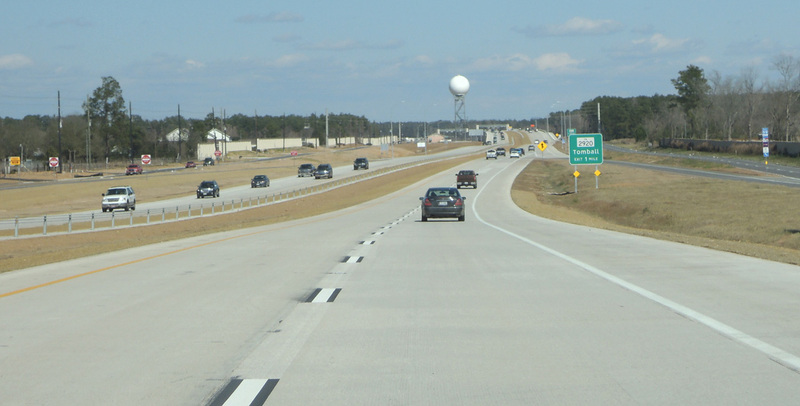 (February 6, 2016) Approaching FM 2920. 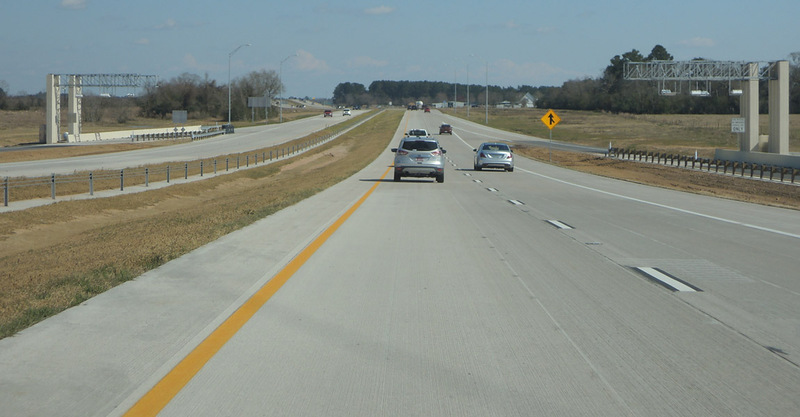 This section has frontage roads. 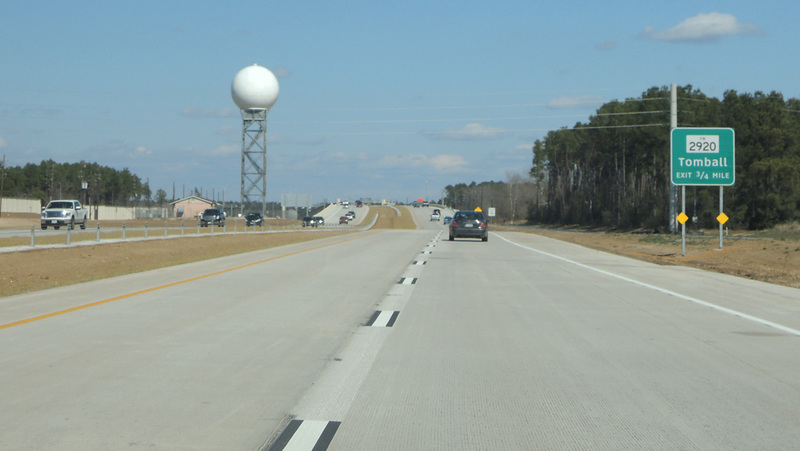 (February 6, 2016) The FAA radar installation is within the right-of-way, between the westbound main lanes and frontage road. 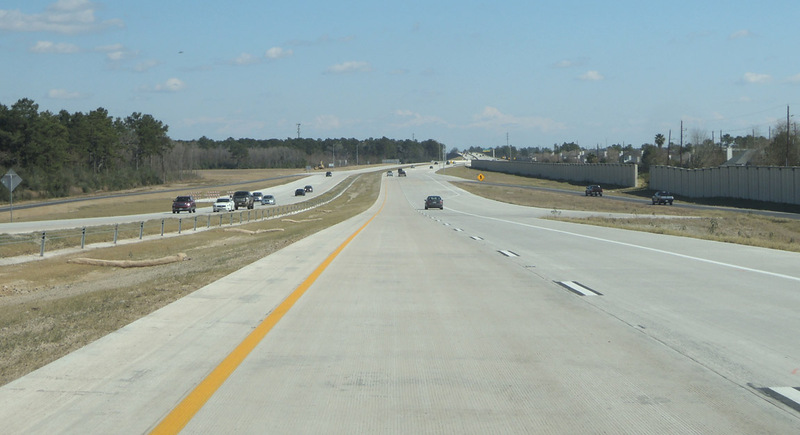 (February 6, 2016) The FM 2920 intersection is the only spot where the Grand Parkway drops below ground level, due to the nearby runway at Hooks Airport and low-flying aircraft on approach. 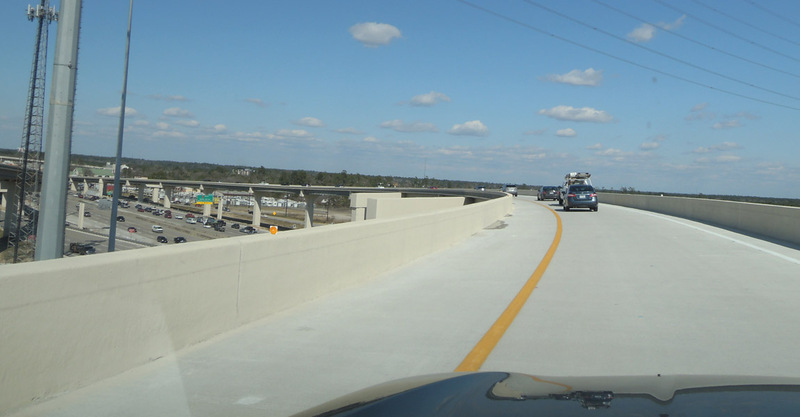 (February 6, 2016) Ahead the parkway crosses over railroad tracks, and the main lanes come together with no median. 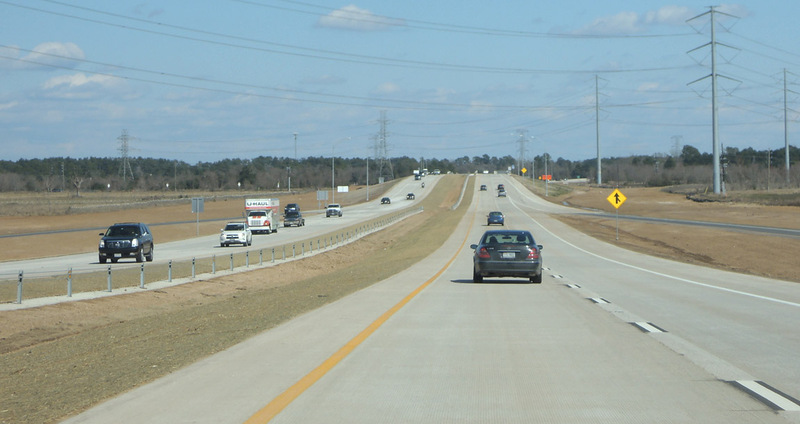 (February 6, 2016) Here the highway parallels a high voltage corridor and railroad. 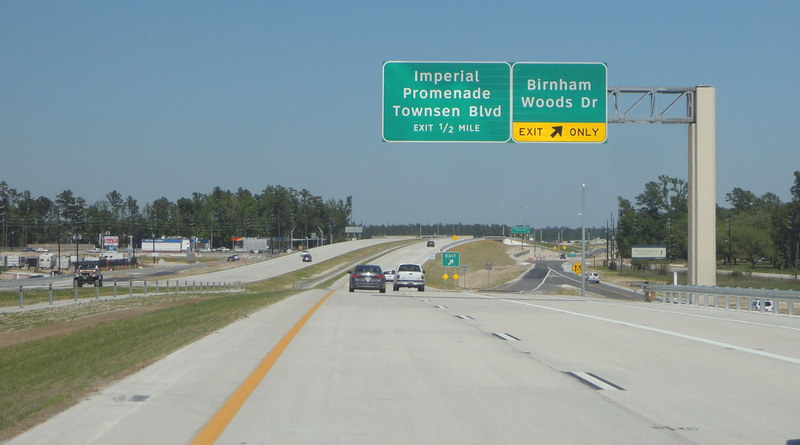 (February 6, 2016) The new Springwoods Village development around the new ExxonMobil campus is on the left. 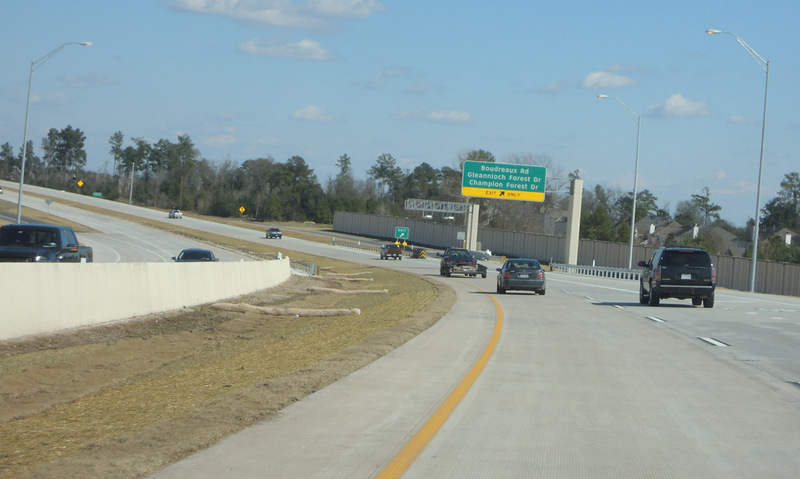 (February 6, 2016) The exit to I-45 northbound, which is a direct conncetor. 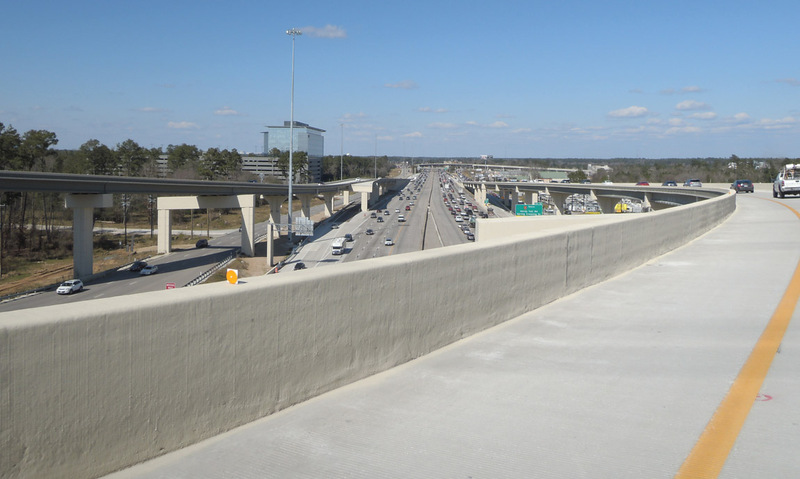 (February 6, 2016) On the connection ramp to I-45 northbound. 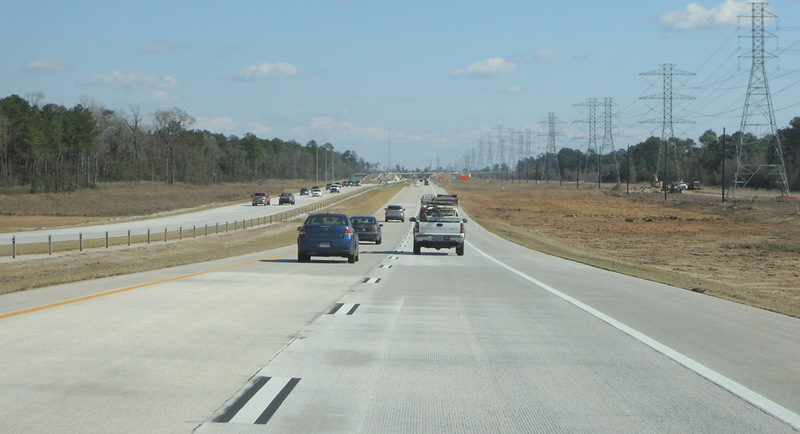 (February 6, 2016) Looking north along I-45, with heavy traffic on northbound I-45. 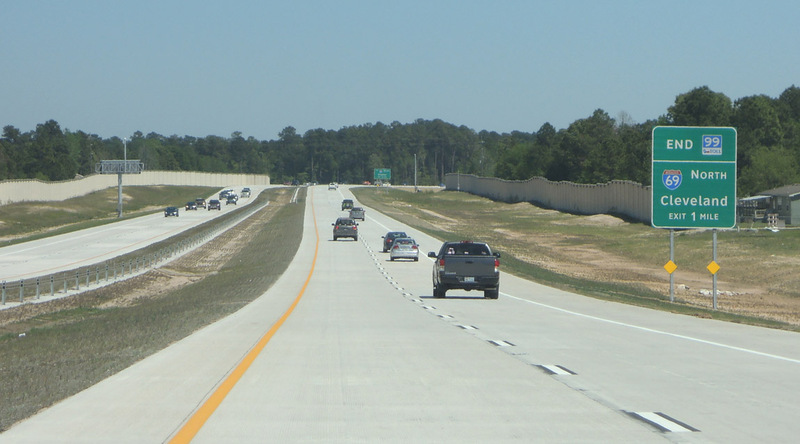 (April 3, 2016) Approaching I-45. This section opened on March 29, 2016, and section G officially starts just ahead. 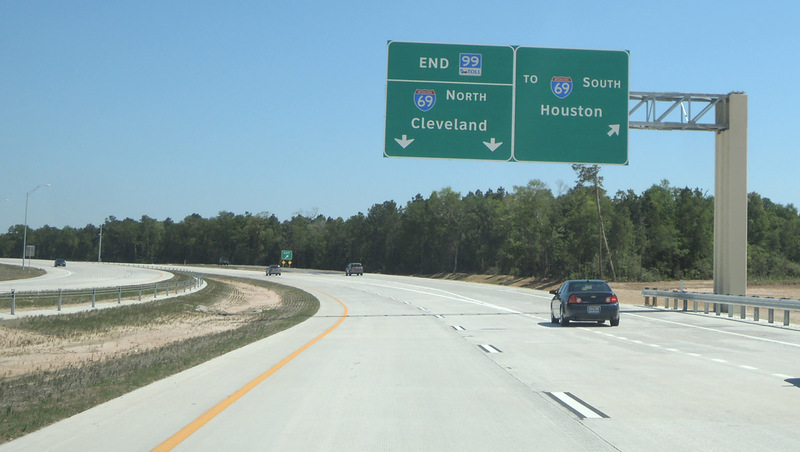 (April 3, 2016) Guide signs to I-69 do not mention US 59 (which is the traditional designation of the highway and until recently the only designation). 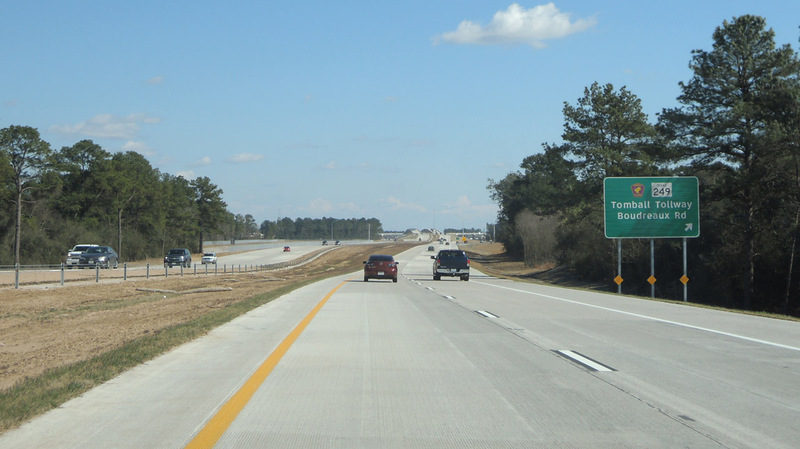 (April 3, 2016) Another sign with no mention of US 59. 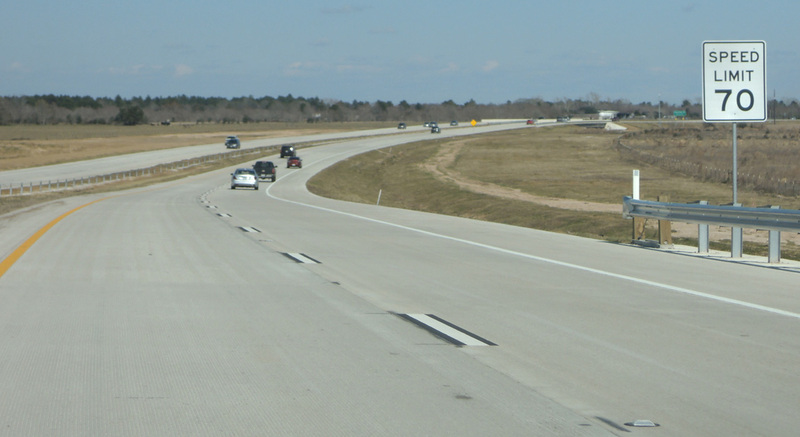 (April 3, 2016) On the ramp to I-69 northbound, looking north along I-69.